makingthenoise (mtn); photo by Joshua Schnable. It’s actually paradoxical to talk about music “made” on the monome. The monome, the open controller, is after all, a grid of buttons. It has no sound of its own. 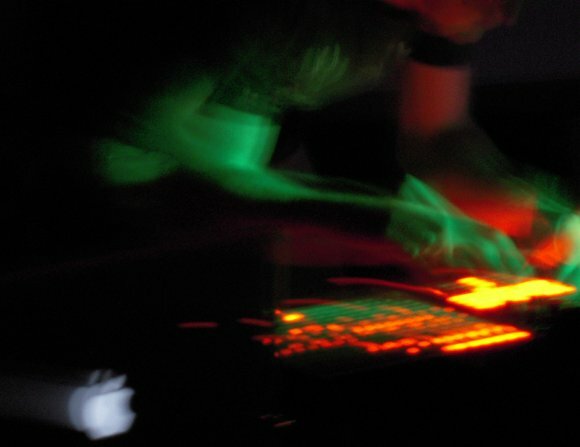 But as such, perhaps its design as a blank canvas – without any indication of how a single button may function, without a screenprinted logo or name – that allows computer musicians to project upon it whatever they wish. The monome, more than any other object designed since the emergence of computer performance, is emblematic of what digital music can be. It’s an empty digital grid, like viewing the world of music software under a microscope. In the lineup: tehn (aka Brian Crabtree), the instrument’s creator, playing on the Max/MSP patch mlr that is partly responsible for the monome’s set, through Daedelus, Brian’s friend who helped raise awareness of the strange box of buttons around the world. There are also fantastic sounds from mtn (makingthenoise), picture in the photos here, Edison, ro, %, and altitude sickness. Here’s what the live sets sounded like. Bet you you can’t hear the monome. tehn in action; photo by me.